CANOCO(tm) CanoDraw(tm) and the Cornell Ecology Programs. 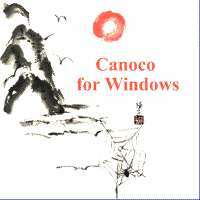 Now Shipping Canoco 4.5 for Windows ! Read about CANOCO, CanoDraw, TWINSPAN and other Cornell Ecology Programs in detail in our descriptive catalog. Find seminal and important references below. Thanks to H.J.B. Birks, you can also browse an extensive Annotated Bibliography of CANOCO, fully web-enabled and cross-linked by topic. Learn how to order from us, payment terms, shipping charges and Educational Discount policies. Find a complete current price list below. We also have an Order Form/Price Sheet for you to download in Adobe Acrobat (PDF) Format. Find legal details about our company which you may need for purchasing or reporting requirements: Our Federal Employer ID Number (FEIN), Dun & Bradstreet DUNS number and federal statistical category information. Is this still an issue? We still see it on purchase contracts, so our statement is still here. Download a copy of our Order Form/Price Sheet in Adobe Acrobat format. Print it, fill it out and FAX to us to place an order. Read more about our software in our descriptive catalog. Each page of the catalog has a link to a preview gif of the order form/price sheet and the PDF file. Print your own copy of our paper catalog! Download this Adobe Acrobat PDF file arranged for back to back printing and staple binding. Read an expanded version of the paper catalog in our descriptive catalog on the web. § The symbol §, used above, links to summary information down this same page. A FORTRAN program for canonical community ordination by [partial] [detrended] [canonical] correspondence analysis, principal components analysis, and redundancy analysis. by Cajo J.F. ter Braak of the Plant Research Institute (PRI), at Wageningen, The Netherlands. A companion program to CANOCO. CanoDraw produces on-screen graphs and publication quality output suitable for use in Mac and PC image editing and desktop publishing software, as well as direct output to various hardcopy devices. by Petr Smilauer of the University of South Bohemia, Czech Republic. A set of indirect ordination and classification programs developed under the aegis of the late Dr. Robert H. Whittaker and written by Mark O. Hill (DECORANA, TWINSPAN), Hugh G. Gauch, Jr. (ORDIFLEX, COMPCLUS) and others. The major programs are available in an MS-DOS version implemented by Charles L. Mohler . Additive Main effects and Mixed Multiplicative Interactions (AMMI) analysis of genetic yield trial data. by Hugh G. Gauch, Jr.
Use these important and seminal references as the basis for a citation search. Davies, P. T. and Tso, M. K. -S. (1982). Procedures for reduced-rank regression. Applied Statistics. 31, 244-255. DECORANA - A FORTRAN program for detrended correspondence analysis and reciprocal averaging. Ecology and Systematics. Ithaca, N.Y.: Cornell University. Randomization and Monte Carlo methods in biology. London: Chapman and Hall. Instability of ordination results under changes in input data order: explanations and remedies Journal of Vegetation Science 8, 447-454. Robert, P. and Escoufier, Y. (1976). A unifying tool for linear multivariate statistical methods: the RV-coefficient. Appl. Statist. 25, 257-265.
ter Braak, C. J. F. (1986). Canonical correspondence analysis: a new eigenvector technique for multivariate direct gradient analysis. Ecology. 67, 1167-1179.
ter Braak, C. J. F. (1987a). Ordination. In Data analysis in community and landscape ecology, R. H. G. Jongman, C. J. F. ter Braak, and O. F. R. van Tongeren (eds), 91-173. Wageningen: Pudoc. ter Braak, C. J. F. (1987b). The analysis of vegetation-environment relationships by canonical correspondence analysis. Vegetatio. 69, 69-77.
ter Braak, C. J. F. (1988). Partial canonical correspondence analysis. In Classification and related methods of data analysis, H. H. Bock (eds), 551-558. Amsterdam: North-Holland. ter Braak, C. J. F. (1994). Canonical community ordination. Part I: Basic theory and linear methods.Ecoscience 1, 127-40.
ter Braak, C. J. F. and Prentice, I. C. (1988). A theory of gradient analysis. Advances in ecological research. 18, 271-317.
ter Braak, C. J. F. and Verdonschot, P.F.M. (1995). Canonical correspondence analysis and related multivariate methods in aquatic ecologyAquatic Sciences 5/4, 1-35. Birks, H.J.B., S.M. Peglar, & H.A. Austin (1994). Reciprocal Averaging: An eigenvector method of Ordination. Journal of Ecology, 61,237-49. Gauch, H.G., Whittaker, R.H., & Wentworth, T.R. (1977). A comparative study of reciprocal averaging and other ordination techniques. Journal of Ecology, 65, 157-74. Hill, M.O. & Gauch, H.G. (1980). Detrended Correspondence analysis, an improved ordination technique. Vegetatio, 42, 47-58. Hill, M.O., Bunce, R.G.H., & Shaw, M.W. (1975). Indicator species analysis, a divisive polythetic method of classification and its application to a survey of native pinewoods in Scotland. Journal of Ecology, 63, 597-613. Gauch, H.G., & Whittaker, R.H. (1981). Hierarchical Classification of community data. Journal of Ecology, 69, 135-52. Rapid initial clustering of large data sets. Vegetatio, 42, 103-11. CANOCO 3.15 and later addresses order dependence and strict convergence in CANOCO. FAX, Phone, and Mail Orders accepted. Please include an end-user name to insure proper notification of upgrades. Clearly mark all letters Air Mail to avoid delays. Add 10% for US shipping locations. Add 20% for Non-US Shiping destinations. Please send payment with your order, or ask to be billed. We will also accept purchase orders. Our terms are 30 days net. A late payment fee of US$15.00 may be added to past due accounts. Educational discounts are available where noted in the price sheet. Our distribution agreements require a University Shipping Address to qualify for such discounts. This address must be a useful contact address for upgrade notices and other developments. You are welcome to take advantage of these discounts even if billing is not to your University. We do not accept Credit Cards, but are happy to ship at your request. You can pay by check after you have received the goods. NOTICE: You are responsible for the payment of any and all applicable taxes, customs or import duties. A pair of excellent textbooks describing CANOCO and its applications. FORTRAN source code available for console version (also requires purchase of Site License. MATMODEL 3 is now available as a Free/Libre/Open Source download. Further information available here. MAT-20rl Discontinued MATMODEL v.2.0 AMMI analysis pkg. 10% for US shipping locations. 20% for non-US shipping destinations. None of our software performs any date operations. Therefore the operation of all of our programs is unaffected by the transition to the year 2000 or leap year calculations. ...from the Microcomputer Power website.